Pictured, from left, are Jane Butler, chaplain and committee chairperson, Auxiliary Unit #49; Derek Sadler, donor, McHatton-Sadler Funeral Chapel; and Connie Schlag, secretary and treasurer, Auxiliary Unit #49. 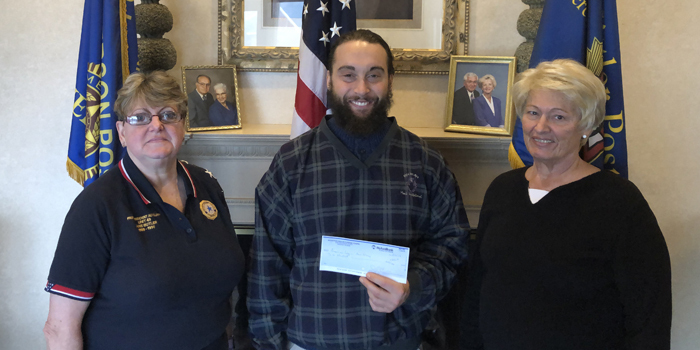 WARSAW — The American Legion Auxiliary recently received a donation of $600 for the Hoosier Girl’s State Program from McHatton-Sadler Funeral Chapel, Warsaw. The Girl’s State Program instructs students in leadership roles, operations, and functions of state and local government. The program will be held in June at Trine University, Auburn, and lasts one week. Participants are eight local young women, seniors in high school, who have been selected from local school systems including Lakeland Christian Academy, Tippecanoe Valley and Warsaw. Upon completion, graduates are eligible to apply for college scholarships underwritten by the State Department of the American Legion. The Girl’s State has been sponsored since the 1940s and continues to train future leaders for their vital roles in the service of God, country and their fellow citizens.